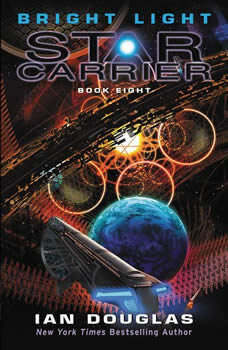 New York Times bestselling military science fiction author Ian Douglas brings us the eighth—and penultimate—Star Carrier novel, Bright Light, combining the best action, adventure, and hard science into this universe-spanning seriesThere’s no more time . . .There’s always more time . . .Trevor Gray has been stripped of his command of the starship America, and is unsure what to do with his life. Having dedicated so much of himself to the service, he knew following the super-AI Konstantin’s advice could have severe consequences. He just never thought he would be out of the fight.Because that’s what Earth is in: a fight against a sinister alien force that is so technologically advanced, there seems little hope. And that’s why he had disobeyed his orders in the first place: to figure out a way to stop them. But now he’s beached.Which is just what Konstantin wanted.For the super-AI has a plan: connect Gray with the Pan-Europeans, and set him on a course to the remote star Deneb. There, he is to make contact with a mysterious alien civilization using the new artificial intelligence Bright Light, and maybe—if they can make it in time—prevent humanity from being wiped from the universe.